The Centre for Jazz and Popular Music Popular Music will present the Minkeys on August 1, 2018. 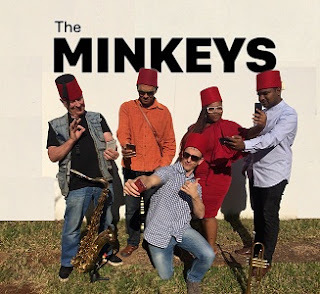 The Minkeys is an eclectic, postmodern South African jazz band with a focus on performance. Last year the band went all out with an original show titled An Evening Down in New Orleans At Egyptian Ella's Club, a story conjured off the lyrics of a traditional New Orleans tune by Walter Doyle called Egyptian Ella. Writing a script, making props and costumes, arranging music, and running the gauntlet of the sticky Durban audience with some sell out successes and some considerably less-than-sold-out success. The show featured a strong element of traditional New Orleans repertoire and arranging devices with stop times and two feels, cymbal splash grabs, standard Louis phrases and some fantastic solo showcasing. In the spirit of the band it also featured some unexpected musical turns and ever-contrasting forays, a reimagining of some material not traditionally associated with the jazz vernacular and some ill-considered attempts at humour. “The main purpose of the band is to be entertaining, much attention is paid (before the band members are paid, of course) on how we present each show, from how silly we can make ourselves feel getting onstage and transitioning between numbers to the contrast in the repertoire and how we share the stage with each other and the room with the audience. “The group comprises some well-seasoned -and not altogether of sound mind- talent from the local Jazz fraternity. Neil Gonsalves aka Doctor Jazz on keys is one of the most exciting musical savants around, with a totally open vista and creative understanding of music that leaves others grinning simply like idiots. Don't get too close if he isn't wearing his muzzle. “Tom Hare on sax is probably the most well-seasoned player in the band having played around the world with many of the icons of the Jazz history books and running not only a number of successful jazz groups including and most notably the Galapagos Duck, an Australian Jazz band still going strong today, but also founding and running one of Australia’s most renowned Jazz clubs, The Basement. Hare drives the concept and brings a wealth of traditional values and vocabulary to the band, he also drives a Honda Accord and has two adorable Rottweilers named Sheila and Bruce. “Zoe Masuku, a former navy seal of a vocalist, is undoubtedly one of the best Jazz voices coming out of this town and definitely someone to pay good money to watch, so come pay some good money. Caleb Frow is also a surprisingly exceptional singer, we put that to good work and let him hold down the grooves on kit and throw in some solid innovative effects on his electronic drum thing. If his lips are moving don't interrupt him, he's counting. Expect a smorgasbord of musical offerings from traditional Jazz, Afro, funk, electro-swing, pseudo classical to modern.